Dreaming of springtime and all the bursting flowers and scents that go along with it? 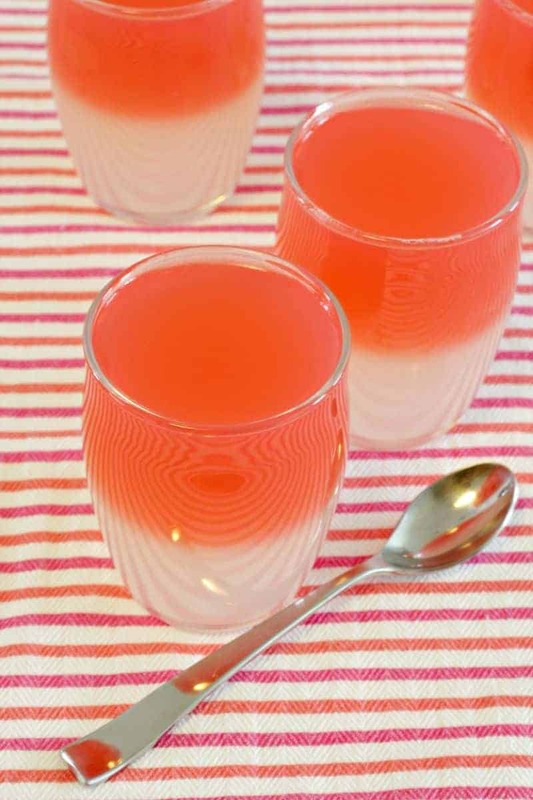 Then you will LOVE this ethereal rosewater jelly recipe, with just a hint of lemon. 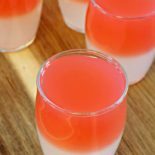 This rosewater jelly is light and bouncy, and it’s delicate aroma and flavor is sure to delight. 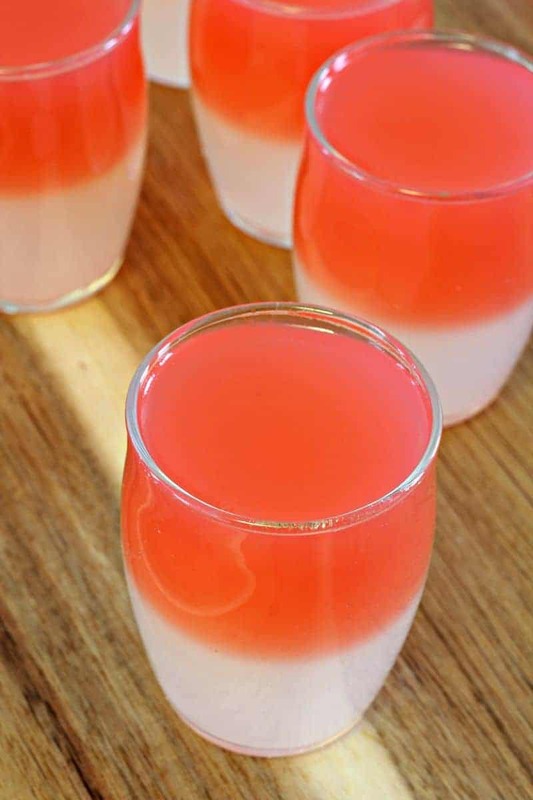 Read on to find out how to make this delicious rosewater jelly (it’s Head Over Heels on the Yum Scale). 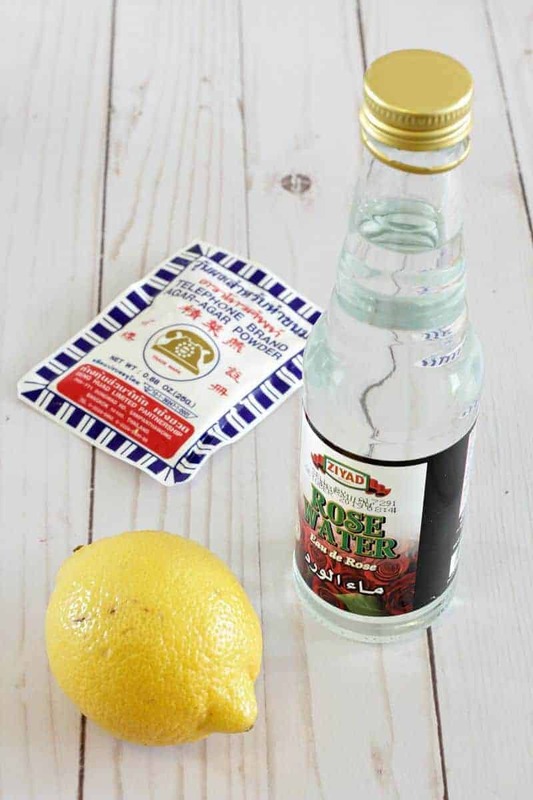 If you aren’t familiar with rosewater, it’s time to open yourself up to the wondrous possibilities! Rosewater is exactly what it sounds like: roses + water. Rosewater has been used for centuries for medicinal and culinary purposes — Cleopatra herself was said to use roses to enhance her beauty! Don’t try and argue with a queen; it’s time to start enjoying rosewater! We are going to be using agar agar powder instead of gelatin to make our rosewater jelly. If you aren’t familiar with agar agar, it basically the plant-based equivalent of gelatin. It is made from seaweed, so it is okay for vegans and vegetarians to consume; it is also gluten-free! It is colorless, odorless, and pretty bland on its own, so you need to use either flavored liquids and/or sugars to liven up the flavor! That’s where they rosewater, lemon, and sugar come into play. 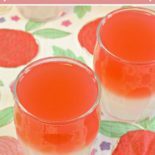 The red food coloring is totally optional, you do not have to use it but that is how I got the ombre effect in this rosewater jelly recipe. I used some open-top glasses that I already had on hand, but I think this recipe would look stunning in some extra-fancy small mason jars, served up alongside some English-style cucumber sandwiches. Can’t you just imagine??? 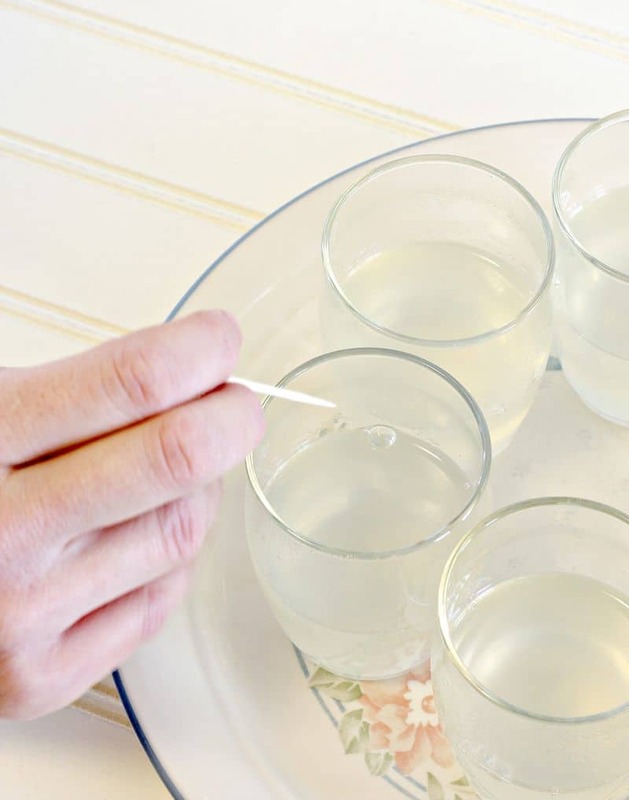 Unlike Jell-O, which melts at room temperature, agar agar is solid at room temperature so you don’t have to worry about it starting to melt right away. This recipe makes six 4 oz sized fruit jelly cups – if that is too much, this recipe can easily be cut in half or even by 1/4. Gather the ingredients listed above. Cut the lemon in half and use the juicer to remove the juice of one half of the lemon. 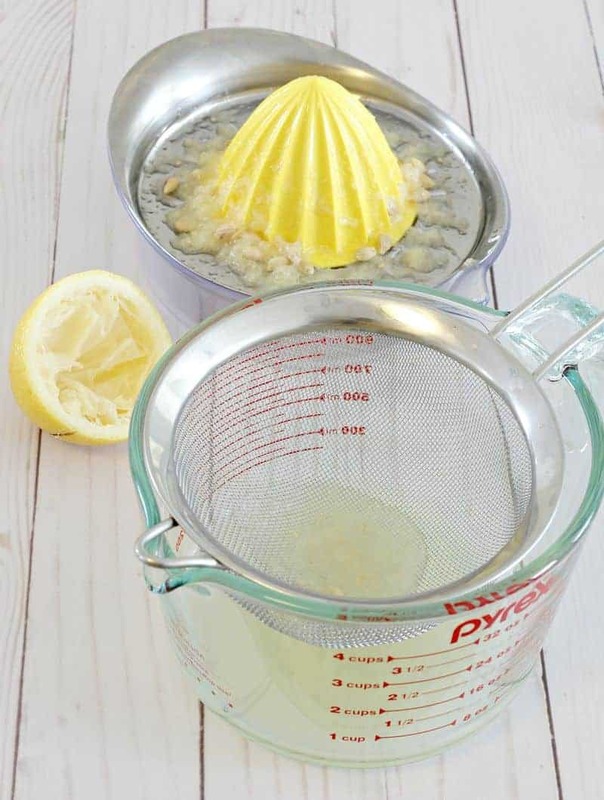 Once the lemon is juiced, strain the juice of the lemon through a fine mesh strainer or cheesecloth. 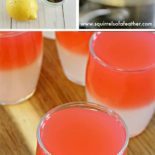 You will need one tablespoon of lemon juice, so if the juice of one half of the lemon isn’t sufficient strain the other half. Bring 4 1/4 cup of water to boil in the saucepan. Once the water reaches a boil, add 5 1/2 tablespoons of white sugar and stir until the sugar has fully dissolved into the water. 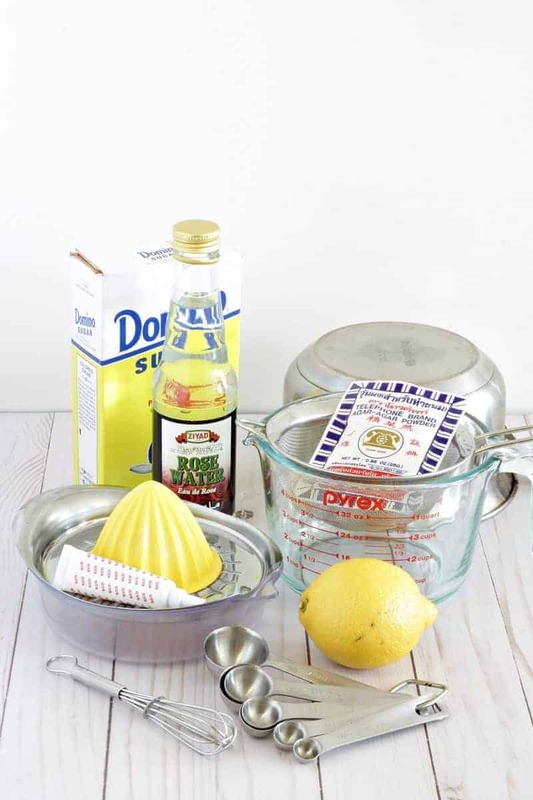 Once the sugar is fully dissolved, reduce heat to a low simmer (just below boiling) and add 4 tbsp of the strained lemon juice and 1 tsp of rosewater. Stir. After the rosewater jelly mixture has cooled slightly, take your glasses or molds (place on a play or tray that will fit into your fridge so you can move it easily and all at once) and begin to slowly and carefully pour the mixture into the molds. If you see any bubbles get a toothpick and poke them into non-existence, otherwise your jelly will have visible bubbles in it. Place the half-full glasses in the fridge for 30 minutes and return the saucepan with the rest of the mixture to the stove to wait. 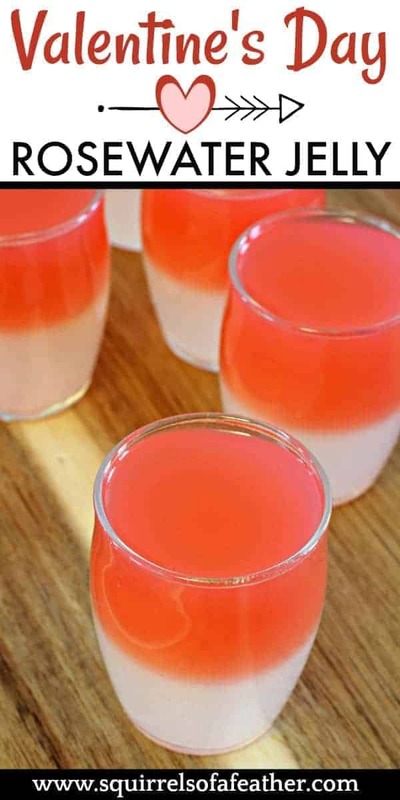 After 30 minutes has passed, remove the fruit jelly cups from the refrigerator. Now is the time to add the red food coloring to the remainder of the mixture. If the mixture has solidified no worried — simple reheat over medium-low heat until it returns to a liquid and add the food coloring. Stir in small amounts of food coloring into you get your desired color. Take the glass cups and carefully fill them until they are nearly full with the red jelly mixture. Return to the fridge and chill for one hour or more. Drop them below and I will get back to you! 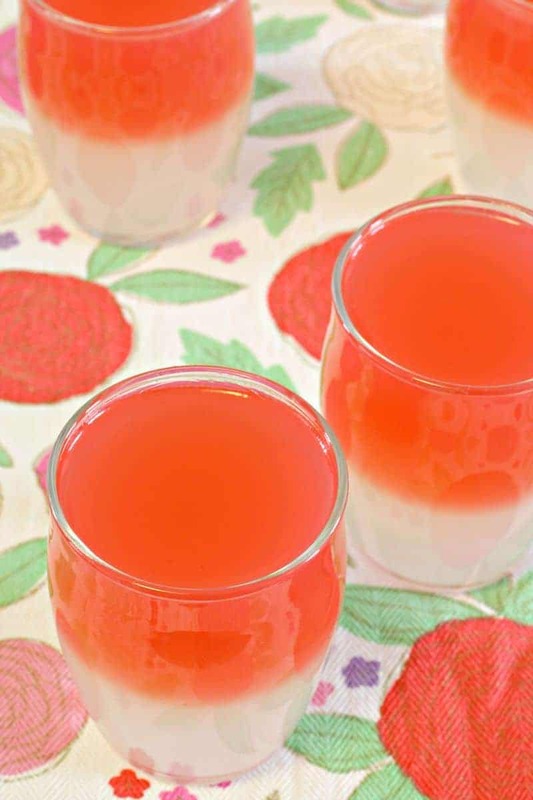 This ethereal rosewater jelly recipe has just a hint of lemon, with a delicate flavor that is sure to delight at picnics, parties, or on Valentine's Day! Cut the lemon in half and juice. Strain through a fine mesh strainer or cheesecloth to remove pulp. Set aside. After the rosewater jelly mixture has cooled slightly, take your glasses or molds and begin to slowly and carefully pour the mixture into the molds. Fill half full only if you want a two-tone rosewater jelly. If you see any bubbles get a toothpick and poke them, otherwise your jelly will have visible bubbles in it. Add the red food coloring to the remainder of the mixture. 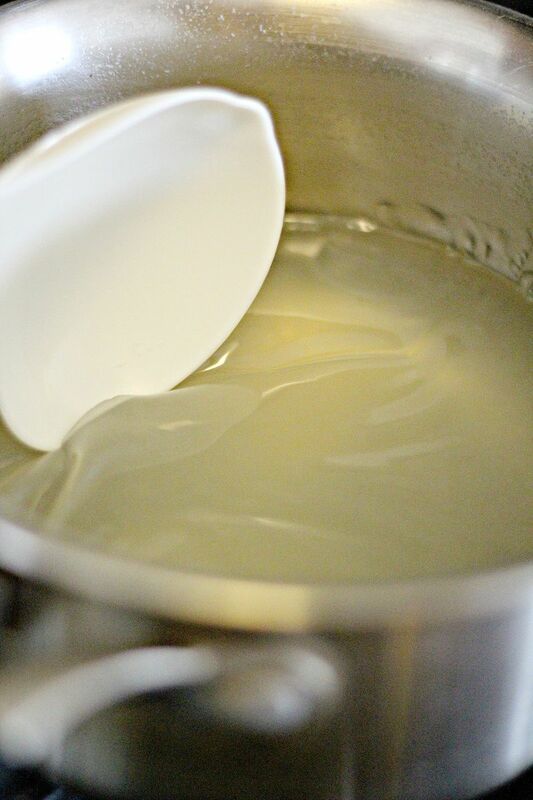 If the mixture has solidified reheat over medium-low heat until it returns to a liquid and add the food coloring. Stir in small amounts of food coloring into you get your desired color. Love these, and the post, of course! These would be yummy with other ‘red’ flavors, too! Yep, the possibilities are endless! Very cool and looks so refreshing! Love the photos! 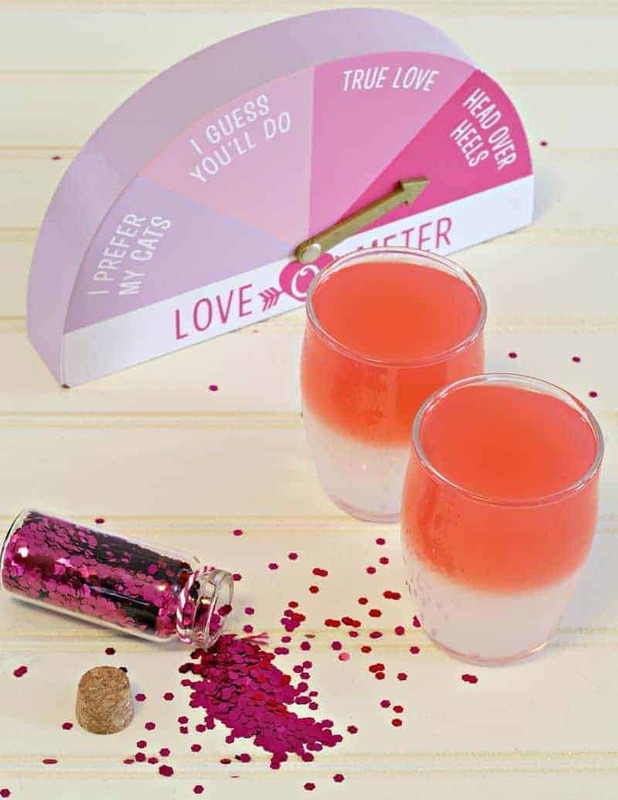 Love the love-o-meter! Isn’t that cute? I picked it up at Target in their irresistible $1-3 aisle.